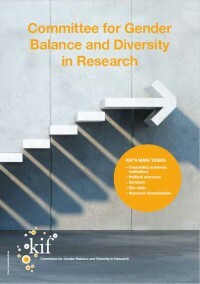 In connection to the conference Creating a competitive edge through diversity, the KIF Committee published a policy brief summing up it’s work and pointing to challenges and opportunities ahead. Lawsuit says the university is inappropriately earning money from the earliest images of slaves and failing to recognize his legacy of racism. In 2018, the Committee for research and external cooperation at AU commissioned five projects to investigate gender bias at Aarhus University. The winner of this year’s Holberg Prize, worth over £500,000, on career setbacks, changing attitudes and decolonising the curriculum. Women are still underrepresented in leadership positions in universities – this has to change, Chris Skidmore writes. The number of women with a career in research is slowly growing in Europe. Still, they remain significantly underrepresented. Member universities would be unable to fill 60,000 jobs from abroad, and face increased costs too, says report. A new article shows that women more often apply gender perspectives in their research. A diverse research group leads to better and more accurate knowledge about the world, according to Mathias Wullum Nielsen. Are you interested in male gender quotas, diversity management or why the Danes are at the bottom in gender equality in the Nordic region? Check out our top ten most read news articles.